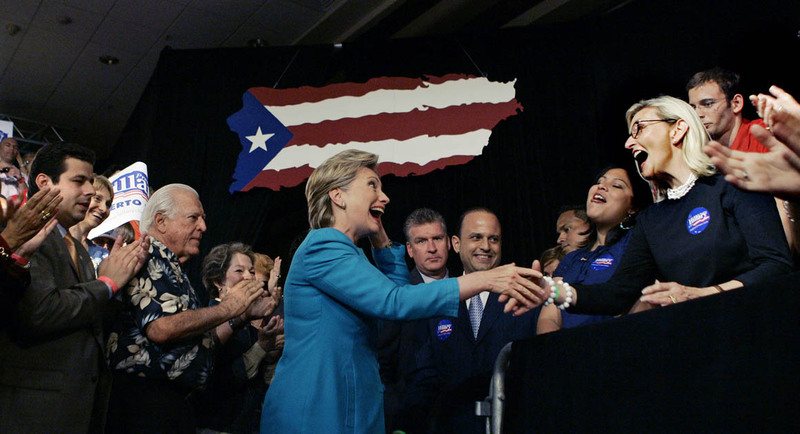 Hillary Clinton is swinging through Puerto Rico today, Friday Sept. 4. The island needs immediate Chapter 9 bankruptcy relief in order to re-structure its $73 billion public debt. All of the major Democratic presidential candidates – not just Hillary – have voiced their support for this. None of them, including Hillary, have done anything about it. Puerto Ricans are fleeing the island in record numbers, and nearly one million of them now live in Florida – a key battleground state, as proven in the 2000 presidential elections. The Puerto Rican vote, in Florida alone, could be decisive in the 2016 election. Hillary recently hired Matt Barreto and Gary Segura, the founders of Latino Decisions, to conduct polling and Latino outreach. The reason for this is simple: Latinos are the largest minority group in the US. If Hillary can lock up the Latino and African-American vote, she wins the election. Sen. Bernie Sanders has drawn within 7 percentage points of Hillary, and is currently leading her in the latest New Hampshire polls. 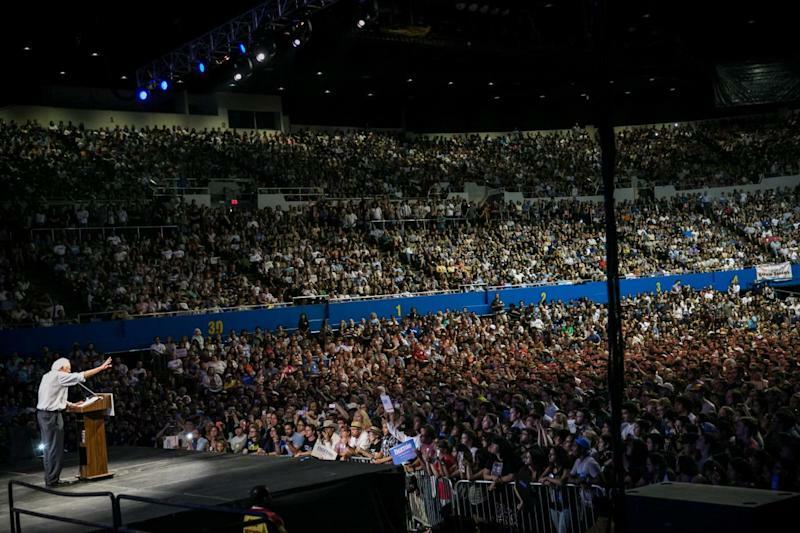 With Sanders drawing large crowds – often over 20,000 – to his campaign appearances, Hillary needs to engineer some early symbolic “wins” with the Latino community. Melissa Mark-Viverito, the Speaker of the New York City Council, endorsed Hillary on Wednesday, Sept. 2. Two days later, on Sept. 4, Hillary is campaigning in Puerto Rico. The following week, Viverito and Gov. Andrew Cuomo are also scheduled to tour the island – to “help resolve” the debt crisis, but actually to campaign for Hillary. Since Viverito is term-limited, and looking for a job in 2017, this works neatly for both of them. The island needs debt re-structuring now in September 2015 – not a “promise” or a “pathway” that might happen two years from now, in 2017. Additionally, since all the major Democratic candidates have espoused the same generic “support” for Chapter 9 relief, there was no basis for the Viverito endorsement – other than the personal advantages it offered to Viverito and Hillary Clinton. If Hillary is serious about helping Puerto Rico, she should use her political influence to create debt relief now, not a vague promise of it two years from now. There is a growing rumor that the Democratic Party, and Hillary in particular, are trying to stuff Florida with angry Puerto Rican voters, who will vote “Democrat” in 2016. In this cynical scenario, Hillary benefits from allowing conditions to worsen on the island – by not pushing for Chapter 9 debt relief, until after the November 2016 election. If that is the case, then Melissa Mark-Viverito would be looking for a federal cabinet appointment, at the expense of everyone in Puerto Rico. Politics doesn’t get more sordid and selfish than that. The 1 million Puerto Ricans in Florida have a great deal of power – but only if they use it. If Hillary gets Chapter 9 bankruptcy protection for Puerto Rico before the March 2016 primary, then Puerto Ricans should vote for Hillary. If she doesn’t, they should vote for Bernie Sanders. That is how you turn your vote into power. Excellent article. I am tired of politicians who just use Puerto Ricans for what they want to get out of them–votes, money, time, loyalty, and the Puerto Rican people get nothing, zip, zilch, nada in return. Please good people, wise up. You are valuable. Have a plan, an agenda. Show those pols how smart you are. Mark-Viverito is playing the worst kind of politics. What a disappointment. What are these politicians doing in Puerto Rico when Puerto Ricans on the island cannot vote in presidential elections? And so-called “radical” Mark-Viverito plays along with the likes of Hillary Clinton! Remember the coup in Honduras? The Israeli war crimes in Gaza? Etc., etc…. In my opinion I dont believe in false promises especially coming from 2 liberal candidates and none are really conservative. i would invest my vote in a real conservative and a person who would stand his ground and take this nation and turn it around from where it actually is going. we need a strong candidate who will bring major changes to Washington. and a God fearing man with the wisdom of solomon and the heart of David a true leader. who will not negotiate with the enemy Iran. my Island is already blessed by God he will rescue it with or without Hillary or sanders. We can not rely on the “if Hillary does this or if Hillary does that”. She is conservative, specially when it comes to foreign policy. Let us remember her position backing the Israeli government against the Palestinians. Puertoricans in the US, specially those living in Florida should vote for Bernie Sanders, who supports the workers, minorities, health care for all citizens, free tuition for students to go to college, etc. His support of these has nothing to do with him running for office. This has been his standing during all these years. He truly believes in what he stands for. Hillary is the usual polititian who makes promises to gain the Puertoricans and other minorities vote and then she forgets that we even exist. VOTE FOR BERNIE. Here’s how this angry Puerto Rican in Florida is voting …. It will depend on who gets the ability for the Island to declare “bankruptcy”!